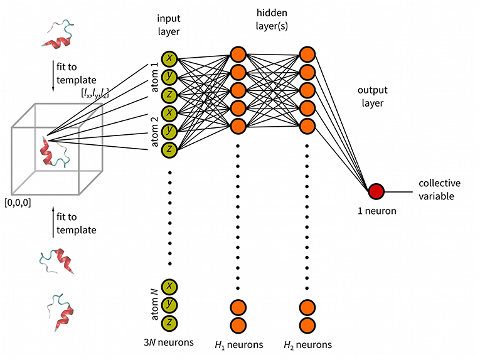 Try our new R package metadynminer for visualisation and analysis of metadynamics results. 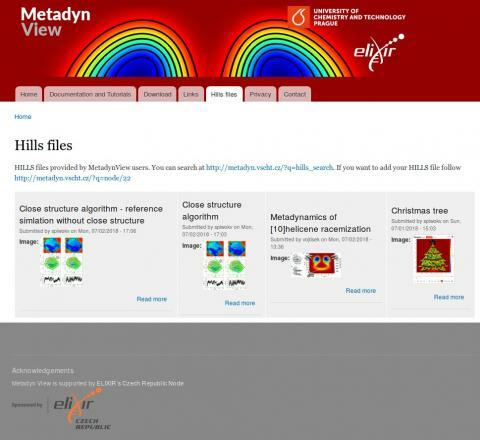 We have enabled users to share their HILLS files on metadyn.vscht.cz. You need to register at http://metadyn.vscht.cz/?q=user. After being approved by metadyn.vscht.cz staff you can login and fill the form at http://metadyn.vscht.cz/?q=addhills. MetadynView can be launched by clicking to a link. You can share your HILLS file on Facebook, Twitter and other networks. 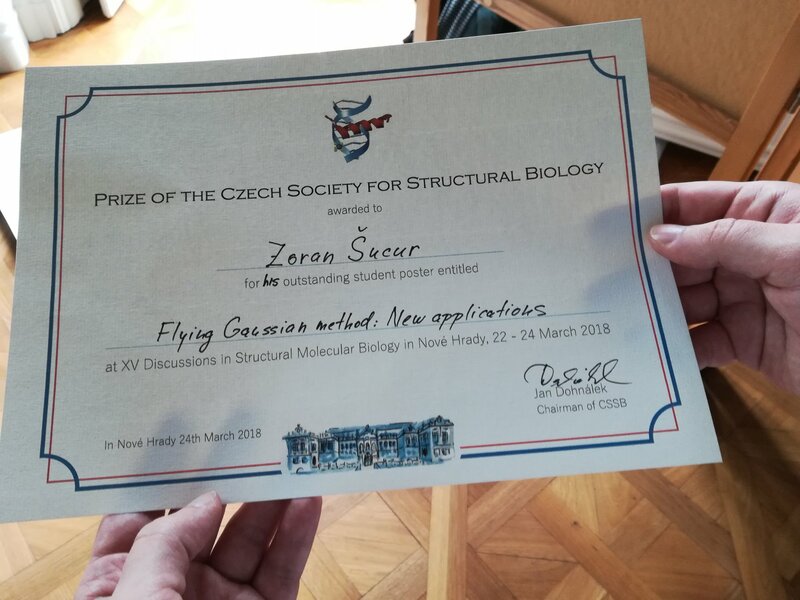 Best poster award for Zoran Sucur from XV Discussions in Structural Molecular Biology and 2nd User Meeting of CIISB in Nove Hrady, congratulations! We have shown that Flying Gaussian and free energy surface reweighting can work together. 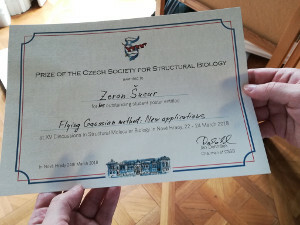 See proof in the article P. Křìž, Z. Šućur & V. Spiwok: Free Energy Surface Prediction by Flying Gaussian Method: Multi-System Representation. Journal of Physical Chemistry B accepted (2017) http://dx.doi.org/10.1021/acs.jpcb.7b09337. 2017 At https://github.com/spiwokv/FlyingGaussianTutorial you can find a flying Gaussian tutorial. 2017 Well-tempered version of Altruistic metadynamics was published. Well-tempered MPI-based Altruistic metadynamics Plumed hack can be found here: MetaD.cpp. Compile with Plumed 2.2.0 and use with WALKERS_MPI ALTFACTOR=0.5 ALTTYPE=4. The parameter ALTFACTOR controls the the factor α, i.e. the "degree of altruism". Higher bias factor values must be used compared with conventional well-tempered metadynamics (typically the value of conventional bias factor multiplied by the number of walkers). ALTTYPE=4 means that for two walkers and HEIGHT=1.0 a hill of height 1.5 is added to "own" system and 0.5 to the other system. ALTTYPE=3 means that for two walkers and HEIGHT=1.0 a hill of height 1.0 is added to "own" system and 0.333333 to the other system. ALTTYPE=2 and ALTTYPE=1 are experimental. 2017 New Metadyn View facelift. 2017 Close structure algorthm for fast (R)MSD calculation in path and property map CVs was published together with Jana Pazurikova, Maria Simkova and Ales Krenek. We are working on implementation to the official Plumed. 2016 New version of Metadyn View and revised web site is provided at metadyn.vscht.cz. 2016 Flying Gaussian Plumed hack can be found here: MetaD.cpp. Compile with Plumed 2.2.0 and use with PACE=1 WALKERS_MPI FLYING_GAUSSIAN. PACE controls the rate of hill moves (PACE=1 means move in every step). 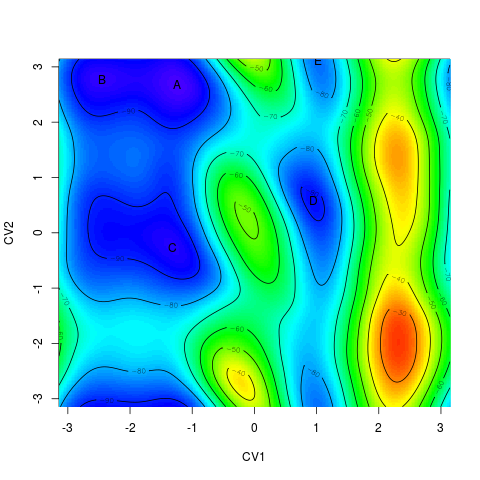 Free energy surface can be obtained from the COLVAR file. September 2016 Our new "Flying Gaussian" sampling enhancment method has been published in JCTC. Flying Gaussian uses multiple walkers similarly to multiple walker metadynamics. Each walker is associated with one Gaussian bias potential hill, which moves together with CV evolution. When multiple walkers accumulate in one minimum they are repulsed by their Gaussians. May 2016 Try our Gibbs energy - equilibrium constant and Eyring equation online calculator. April 2016 New video demonstrating altruistic metadynamics is available at Youtube. March 2016 We would apreciate any feedback regarding our metadynamics viewer MetadynView. Please find few minutes to fill a questionaire. February 2016 We have published a study presenting altruistic metadynamics. This variant of multiple walker metadynamics makes it possible to simulate chemically different systems and to predict their free energy surfaces. You can add this MetaD.cpp file to Plumed 2.2 and compile. Altruistic metadynamics can be used as a multiple walker metadynamics with WALKERS_MPI=off (WALKERS_MPI=on in progress) and with ALTFACTOR=0-1.